Of Nebraskas five dozen officially recognized spring games, the very first one – 60 years ago today – surely ranks as one of the least accurate foreshadowers of the fall season. The Varsity struggled to a 13-13 tie against a patchwork Alumni team that was expected to lose by several touchdowns. Who on that day could have predicted the offensive fireworks that would unfold six months later? The same squad that could scarcely muster a first down in the opening half on this spring Saturday would make its mark in the autumn as the highest-scoring Husker team in a span of more than 40 years. The 1950 Cornhuskers would finish No. 3 nationally in rushing and No. 9 in total offense. And a home-grown halfback named Bobby Reynolds would dazzle crowds while setting an NCAA scoring record that would stand for more than 35 years. 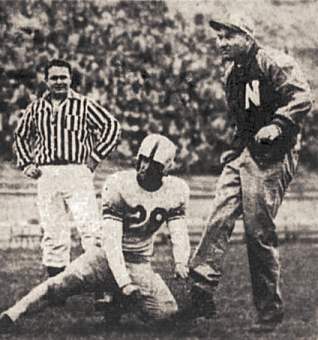 On the Alumni roster were some players as recent as the 1949 teams seniors and others from further back, including 47-year-old Ed Weir, the two-time All-America tackle from the 1920s who was now employed as Nebraskas track coach. Weir didnt even suit up, but strangely enough, he would score and Reynolds would not. The Varsity trailed 7-0 at intermission, unable to register a first down until midway through the second quarter. The Alums, meanwhile, moved the ball effectively much of the time, sometimes on plays invented in the huddle. Still, it took a fumble recovery at the Varsity 24 by tackle Ted Doyle – the 37-year-old operator of a Fairbury bowling alley – to set up the old-timers TD. Six plays after the turnover, Sam Vacanti passed to Cletus Fischer from the 5 for the score. Weir, wearing a letter jacket and slacks, kicked the extra point. Shortly before halftime, coach Glassfords eleven appeared ready to even up the score, but the ball was fumbled away inside the 10. The Scarlets pregame slogan, Varsity by 40 points, wasnt panning out. The Varsitys frustrations continued through most of the third quarter, with a fumble ruining another scoring chance. But lightning finally did strike – though it was courtesy of halfback Ron Clark, not the soon-to-be-famous Reynolds. With the Varsity operating from its 36, Clark, a speedster from Ravenna, took advantage of good blocking around right end and raced down the west sideline 64 yards for a TD. The conversion attempt was muffed, but an offside penalty gave the Varsity a retry, and Fran Nagle kicked it through to make it 7-7. The score wasnt knotted for long. The Alumni answered with a 13-play, 64-yard drive, capped by Vacantis 17-yard TD aerial to Ken Fischer, brother of Clete. Weirs extra-point kick was blocked, so the score stood at 13-7. Reynolds fielded the ensuing kickoff at the 17 and returned it to the Varsity 42. A 15-yard run by Clark and some ground gains by Reynolds drove the Varsity to the 10, and Clark ran it in from there on another well-blocked play. A bobbled snap doomed the extra-point try, and the teams were tied at 13. In the waning minutes, the Varsity got a chance to break the stalemate when Don Bloom grabbed a Ken Fischer fumble in midair and returned the ball to the Alumni 30. But the greybeards dug in on defense, and on the games final play, Fischer atoned for his miscue by intercepting Clarks desperation heave in the end zone. NOTES: The Varsity had just six yards passing but in the fall would average 85.7 ... The Alumnis coach was Ray Prochaska, from the Rose Bowl team of 10 years earlier ... Several Alums were veterans of the gridiron and World War II. Jack Hazen, for example, lettered in 1941, 42, 46 and 48. ... Before he was an Omaha city councilman, Vacanti was a spring-game regular. In 1961, he was still at it, quarterbacking at age 39 in the final Varsity-Alumni game. ... Although this is the first one in Nebraska's official records, spring games were played on occasion at least as far back as 1922. Coach Bill Glassford gave the Alumni several players, but few of them played. Players final varsity season, if known, in parentheses.